Capt. 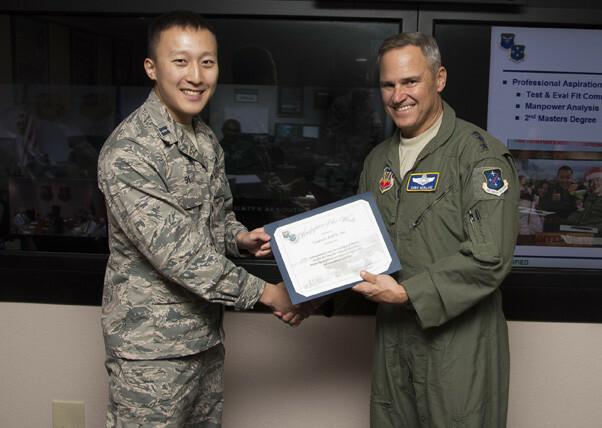 Jeff Shi, 12th Air Force (Air Forces Southern) operations research analyst, smiles after being presented the Warfighter of the Week from Lt. Gen. Chris Nowland, 12 AF (AFSOUTH) commander, during a staff meeting at Davis-Monthan AFB, Ariz., Oct. 19, 2015. DAVIS-MONTHAN AIR FORCE BASE, Ariz — — Capt. Jeff Shi, 12th Air Force (Air Forces Southern) operations research analyst, was recognized as the Warfighter of the Week, October 19, 2015. Shi, a native of Austin, Texas, has been serving in the Air Force for 4 years. 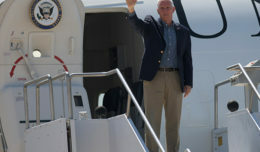 After graduating high school, he attended the University of Texas as an AF Reserve Officer Training Corps cadet. He graduated with a Bachelor’s of Science degree in Computer Science. As an operations research analyst, he is responsible for providing integrated analysis of air, space and information operations assessments and lessons learned across the AFSOUTH area of operations. “I would say that one of the best parts of doing what I do is that I’m able to see the Air Force from a different angle and perspective than most,” said Shi. That ability to see information from a different perspective is a key to success in his career field. In his personal time Shi enjoys recreational shooting, playing sports, and working out to keep himself physically fit. He’s also been trying his hand at home brewing. In the future Shi would really like to focus on becoming a proficient technical expert in his job with the hopes of returning to the test and evaluation world. 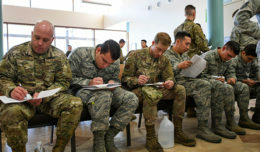 Warfighter of the Week is an opportunity for the Airmen throughout 12th AF (AFSOUTH) to share their story. 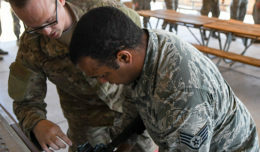 The Warfighter of the Week intuitive also aligns with the 12th AF (AFSOUTH) commander’s priority of creating a work environment where someone knows you both professionally and personally. These outstanding Airmen are selected by their directors based on their contributions to the Air Force’s mission.